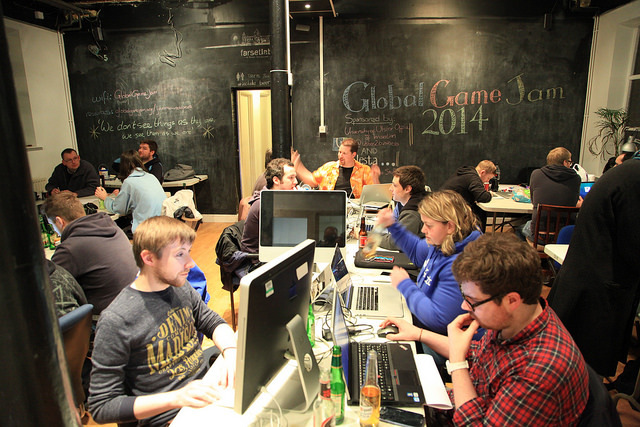 This year’s Global Game Jam weekend exceeded our expectations once more! Congratulations again to the winning teams behind Digimancers, Witches Brew and 7 – respectively placing 1st, 2nd and 3rd in our local #GGJ16 Belfast competition, with a special mention from the judges for the beautiful The Path. 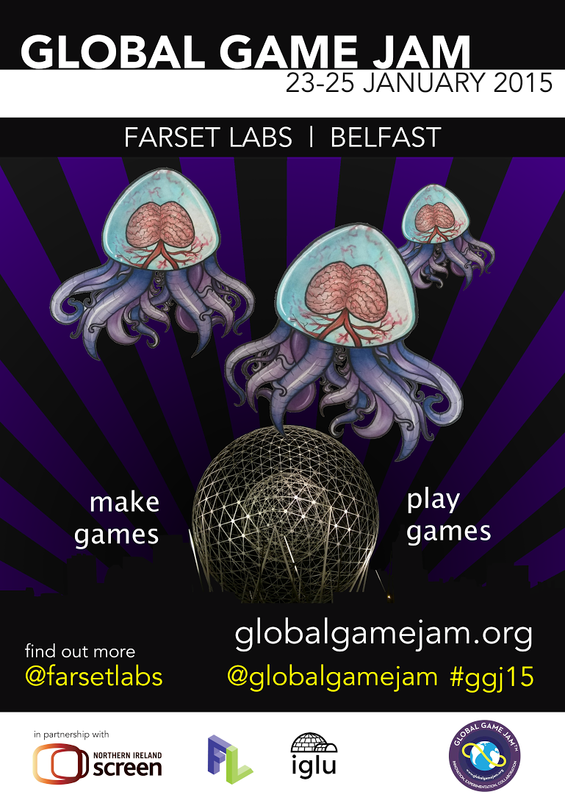 Global Game Jam at Farset is back once more for 2015, in partnership with Northern Ireland Screen. The Game Jam will run from Friday 23rd to Sunday 25th January, and is a chance to meet some great people and develop a fun game with a theme. The theme will be announced on the Friday night; there will be plenty of people there to team up with to create something interesting and, most importantly, to have fun! 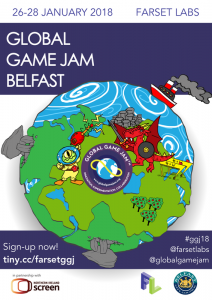 Register on the Global Game Jam site to participate, and reserve your seat on our Eventbrite listing for the game jam. The event is free, and meals are catered! The theme will be announced at 5pm on Friday 23rd January (to accommodate Hawaii) so we recommend all participants to be in Farset before that time, or send word if you will be arriving later on. We look forward to seeing you all for this, as it should be a great weekend! More information will be provided in the run-up, but please feel free to contact events@farsetlabs.org.uk or ask us questions via Facebook or Twitter with the #GGJ15 tag. Brought to you to in partnership with Northern Ireland Screen, and with support from Iglu Media. 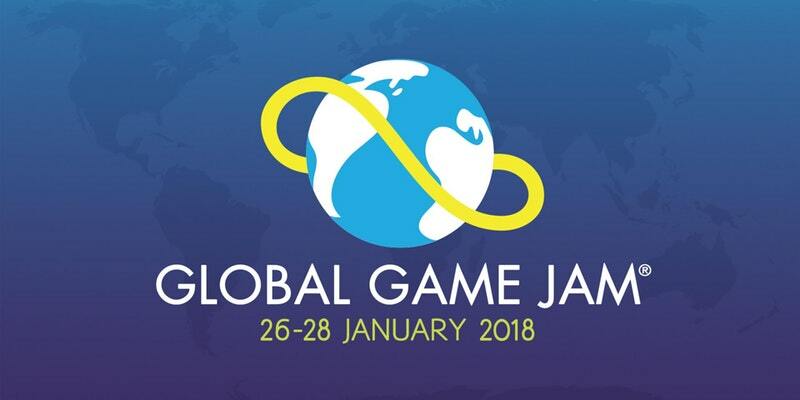 Global Game Jam is essentially a hackathon, focused on games of all sorts, from full-scale console productions to mobile, web-based and embedded games, as well as non-digital productions like board and card games. Some will be frivolous, others developed for solid causes, such as social impact in the case of the Games For Change movement. There are already a number of large sponsors involved in this year’s global event, including Facebook, Unity and Github. 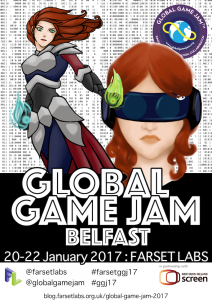 The first Global Game Jam ran in 2009, and this year there are already over 480 individual Jam sites registered around the world. We will be live streaming video from sites all over during the 48hr event. There will also be an opportunity to see and play other teams’ games at the end of the event. The details of the venue are also available on our Global Game Jam listing.